People around the world approve of key elements of economic globalization and believe that free trade and free markets are good for their countries. At the same time, however, many say that globalization entails some economic, environmental and cultural downsides. Support for free markets has increased; most publics endorse a capitalist approach to economics, even if that creates a gap between rich and poor. Yet there also is broad support for a government safety net to aid the neediest in society. And few favor economic growth at the expense of the environment; majorities in nearly every country surveyed say the environment should be protected, even if it means less growth and a loss of jobs. There also are widespread concerns about the impact of global change on tradition and culture. Large majorities in nearly every country feel their traditions need protection from foreign influences. And while support for economic globalization remains high, the belief that trade benefits people’s countries has declined in much of Western Europe and the United States. In all 47 nations included in the survey, large majorities say international trade is a good thing for their countries. In nine countries, at least 90% of respondents support international trade. Positive views of international trade are particularly widespread in Africa, the world’s poorest region. More than eight-in-ten people in the 10 African nations surveyed believe that trade ties are having a positive impact. Some publics have become more receptive to trade in recent years. In 2002, Jordanians were particularly skeptical of the benefits of trade, with just 52% saying trade with other countries was good for Jordan. In the current survey, 72% of Jordanians express that view. Positive views of international trade also have increased in Argentina, though less dramatically (60% in 2002, 68% currently). Overall, however, views about trade have grown somewhat more negative in nearly half of the 35 countries that were surveyed in both 2002 and 2007. In 14 countries, the proportion expressing positive opinions of foreign trade has declined substantially. By contrast, positive opinions of trade have increased in just four countries, and has held fairly steady in 17 countries. Notable declines are particularly common in the advanced economies of the West. Although support for trade remains high in Western Europe, enthusiasm has diminished in Germany, Britain, France and Italy. However, the largest decline among the 35 countries for which comparative data are available has taken place in the United States. The country with the world’s largest economy is the least likely among surveyed countries to embrace global trade. Just 59% of Americans say trade with other countries is having a good effect on the U.S., down sharply from 2002, when 78% believed it was having a positive impact. The American public’s views vary by age, income and party identification. 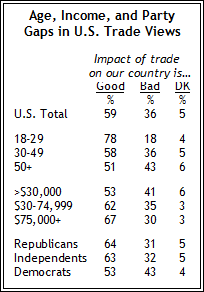 Roughly eight-in-ten (78%) of those younger than 30, and 58% of those ages 30 to 49, believe that trade has a positive impact on the United States. By comparison, people ages 50 and older are more divided (51% good, 43% bad). Wealthier Americans also are more likely than poorer people to support international trade; two-thirds (67%) of those with household incomes of $75,000 or more think it has a good impact, compared with only 53% of those with incomes below $30,000. In addition to having positive views about international trade, the surveyed publics also have generally favorable views of multinational corporations. In 41 of 47 countries surveyed, majorities or pluralities say that foreign companies are having a good impact on their countries. However, opinions of multinationals in the West have declined since 2002. Overall, Western Europeans take a relatively skeptical view of companies from other countries. Among 47 nations surveyed, France is the only country where a majority says that foreign corporations are having a negative effect. In 2002, the French were slightly more likely to take a positive view of foreign companies (50% good, 45% bad), but today a solid majority believes they are having a negative impact (44% good, 55% bad). Positive views of foreign corporations also have declined by 13 percentage points in Italy, 12 points in Great Britain, and by 10 points in Germany. Canadians also have lost some of their enthusiasm for foreign companies. Five years ago, 55% of Canadians said they were having a good impact on Canada; today, fewer than half (48%) express this view. In the United States, 50% now see foreign companies as having a positive impact, compared with 45% in 2002. As is the case with opinions about trade, younger Americans express a more positive view of multinational corporations than do older people: 59% of 18-29-year-olds say foreign companies are having a good effect on the United States, compared with 45% of 30-49 year-olds, and just 38% of those ages 50 and older. In contrast with views about international trade, however, there are no significant differences among income levels and partisan groups. Indeed, virtually identical percentages of Republicans (45%), independents (45%) and Democrats (44%) believe foreign corporations have a positive impact on the United States. Interestingly, in China and India, two rapidly expanding Asian economic giants, trends have moved in different directions, with the Chinese growing less likely to believe foreign corporations are helping their country and Indians becoming more likely to see a positive impact. India’s South Asian neighbors Bangladesh and Pakistan also have become substantially more welcoming to foreign companies over the last five years. In Latin America, positive views of foreign companies have declined sharply in Bolivia (by 11 points). But many more Argentines express positive opinions of foreign multinationals than in 2002. Still, just 39% of Argentines say foreign companies are having a positive effect on the country, which is the lowest percentage among Latin American countries surveyed. Global support for free markets, already widespread, has increased. Majorities in 39 of 47 countries believe that most people are better off in a free market economy, even though some people may be rich while others are poor. Moreover, in 17 of 35 countries for which comparative data are available, support for free markets has risen substantially since 2002, while declining in just five countries. In particular, support for free markets has increased in Asia, Eastern Europe and Latin America. In Asia, Bangladeshis, Indians, Pakistanis and Japanese have all become more supportive of free markets since 2002. And in China – which is still governed by the Communist Party, although it has greatly liberalized its economy – support for free markets is overwhelming. Three-in-four Chinese say people are better off in free markets, even if that means inequalities in their society. In the formerly communist nations of Eastern Europe, capitalism receives more mixed reviews. Still, support has risen steeply in Poland, Russia, and Bulgaria, each of which has enjoyed strong economic growth in recent years. Africans generally tend to embrace free markets. In the Ivory Coast, Nigeria, Kenya and Mali, more than three-in-four say free markets generally make people better off. Similarly, in economically struggling Middle Eastern nations such as Lebanon and the Palestinian territories, most back a capitalist approach – a view shared in two of the region’s wealthiest countries, Israel and Kuwait. In other economically advanced nations, belief in free markets also is high, even though several of these nations have recently experienced slow economic growth. For instance, Italians voice strong support the free market, despite anemic growth rates over the last few years. This high degree of confidence in the market is not shared by all wealthy nations, however: in France, 55% say people are better off in free markets, while the Japanese are evenly divided (49% say people are better off in free markets vs. 50% who disagree). While most of those surveyed believe that free markets are preferable even if they result in economic inequality, they also believe government should take care of those who are left behind by economic competition. In all 47 countries, majorities agree with the statement “It is the responsibility of the government to take care of very poor people who can’t take care of themselves.” In 30 countries, majorities say they completely agree with the statement. Over the past five years, however, strong support for a social safety net has fallen in many countries. In 17 of the 34 countries where comparative data is available, there have been significant declines in the numbers completely agreeing that the government should look after the very poor. The biggest declines have taken place in India (-17 percentage points), South Africa (-16), Russia (-13) and South Korea (-13). The Japanese are the least likely to support a safety net. About six-in-ten (59%) agree that looking after the very poor is the government’s responsibility, and just 15% completely agree. Two-thirds of Egyptians and Jordanians say government should take care of the poor – a solid majority, but still a much lower level of support than in most countries. Seven-in-ten Americans agree that government must help the poorest in society, but there are significant differences across party lines. While large majorities of Democrats (83%) and independents (71%) agree, Republicans are more closely split on this issue (52% agree, 44% disagree). There also is a slight gender gap, with American women (74% agree) somewhat more likely than men (66%) to think this is a proper role for government. In several countries, however, publics are more divided. The clearest example is Indonesia, which is roughly split between those who agree (46%) and those who disagree (50%). Egyptians (53% agree, 44% disagree), Jordanians (53% agree, 45% disagree) and Nigerians (54% agree, 44% disagree) also are somewhat divided over this question. Among economically advanced nations, the French are less likely than others to say environmental concerns should take precedence (62% agree, 39% disagree). In the United States, two-thirds (66%) prioritize the environment, even if it means job losses, although this opinion is much more common among Democrats (73%) and independents (72%) than Republicans (50%). In most countries surveyed, people are concerned about the role that government plays in their everyday lives. Majorities in 29 of 47 nations agree that the state controls too much of their lives. And worries about state influence have grown since 2002. In 16 of 34 countries where trends are available, people are now substantially more likely to say the government is too involved in their daily lives. Throughout much of both Western and Eastern Europe, people are more likely to express concerns about government control than they were in 2002. Increases have been particularly sharp in Poland, Germany and the Czech Republic. The only exceptions to this rising trend are the two countries that were formerly a part of the Soviet Union – Russia and Ukraine. Concern about government interference is consistently higher in Western Europe than in the former Eastern bloc, though concern in most of these former Soviet states has grown significantly in recent years. Worries about government influence are on the rise in South Asia. Bangladeshis and Indians are much more concerned about the state’s role now than in 2002. Meanwhile, in Pakistan, fully eight-in-ten say the state is too involved in their daily lives. Concerns also are up considerably in Venezuela, where President Hugo Chavez has consolidated and increased his government’s power over the last few years. A slim majority of Venezuelans (55%) say the state controls too much of their lives, up from 39% in 2002. In today’s rapidly changing world, people from nations both rich and poor worry about losing their traditional culture. In 46 of 47 countries, majorities say their traditional way of life is getting lost. The lone exception is Sweden, and even there 49% express this view. Concern about the loss of tradition also is a little less widespread in the Middle East than in other regions, with fairly modest majorities in Israel (56%), Egypt (56%), Jordan (53%) and the Palestinian territories (51%) saying that their traditional ways of life are getting lost. Not only do most people believe they are losing their way of life, they also want to take steps to protect it from foreign intrusion. At least half of those surveyed in 46 of 47 countries agree with the statement, “Our way of life needs to be protected against foreign influence.” Throughout much of the developing world, large majorities voice concerns about foreign threats to their traditions. More than 85% in India, Tanzania, Kenya, Indonesia, Turkey and Egypt agree that their traditions must be protected. However, there are a few exceptions, particularly in Latin America, where Venezuelans and Peruvians are divided on this issue. Fully eight-in-ten in Italy and 72% in Spain agree that their way of life needs protection from foreign influence. But these concerns are generally less prevalent in other Western nations. In Great Britain and Germany, narrow majorities agree that their way of life needs protection (54%, 53%, respectively). Opinions are almost evenly divided in France, a country famous for vigilantly protecting its language and culture; 52% of French say their way of life needs protection, while nearly as many (48%) disagree. Again, the clear outlier is Sweden, where only 29% are worried about foreign influence – a much lower level of concern than in any of the other 46 countries included in the study. In the United States, Canada, Japan, and much of Europe, young people are less concerned about foreign influence. Among both Americans and Japanese, there is a 15-point gap between older people and younger people on this question. Meanwhile, less than half of Swedes, Britons, Germans and French under age 40 think their way of life should be protected against outside forces. Younger people in parts of Eastern Europe also are less worried – there are significant age gaps on this issue in Bulgaria, Poland and Ukraine, although in all three countries solid majorities of both age groups still say their way of life should be protected. The pattern is not uniform in Europe, however, as 18-39 year-olds in Italy, Slovakia and the Czech Republic actually are slightly more worried about foreign influence than are those over age 40. As with opinions on trade, American attitudes toward foreign influence vary by age, income and party. As noted above, younger Americans and wealthier Americans are more pro-trade, and these same groups are also less worried about threats to the culture from abroad. Roughly half (51%) of those younger than 30 say their way of life needs protecting compared to roughly two-thirds (68%) of people age 50 and older. Similarly, just over half of Americans with household incomes of $75,000 or more worry about foreign influence, while seven-in-ten of those with incomes below $30,000 are concerned. Partisan divisions are somewhat different from the international trade issue. While Democrats are particularly worried about foreign trade, they are less concerned than Republicans about foreign influences on our culture – seven-in-ten Republicans say their way of life must be protected against foreign influence, compared to six-in-ten Democrats. Meanwhile, independents’ attitudes about foreign trade closely mirror those of Republicans, but on this question, independents are very similar to Democrats.